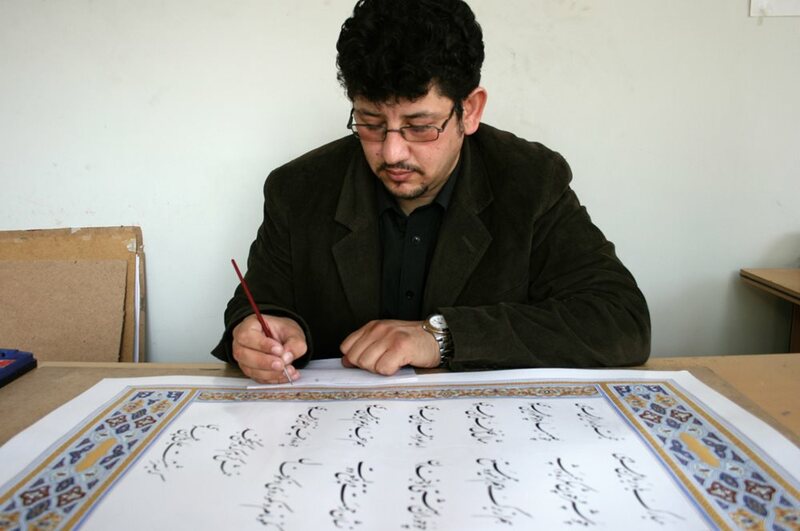 Khwaja Qamaruddin Cheshti, who holds a master’s degree in Afghan literature from Kabul University, teaches calligraphy at the Turquoise Mountain Institute for Afghan Arts and Culture in Kabul. This detail shows part of a large, patterned screen known as a jali. 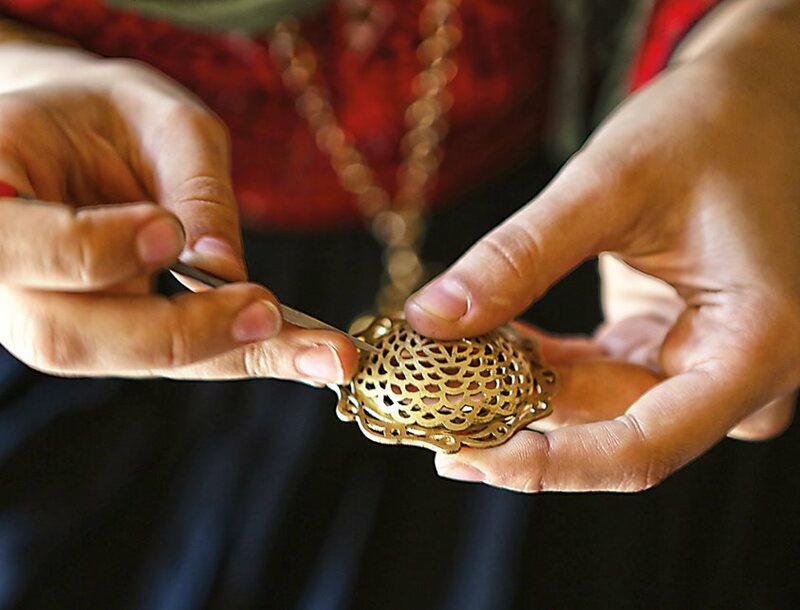 Produced by a Turquoise Mountain team of 14 masters and students, it was inspired by a 13th-century Mughal stone jali, and it was featured in the "Ferozkoh" exhibitions in both Doha and London. Cheshti is speaking through a translator from the Turquoise Mountain Institute for Afghan Arts and Architecture in Kabul, Afghanistan. A restored, 19th-century fort in the historic Murad Khane neighborhood, its alcoves topped with delicately pointed arches, it is a fitting backdrop to speak about two weeks he and more than a dozen Afghan artists and craftspeople spent in Doha, Qatar, at the Museum of Islamic Art—or mia—where Cheshti rediscovered this age-old truth. Their experience crystallized in the exhibition “Ferozkoh: Tradition and Continuity in Afghan Art” that paired up contemporary Turquoise Mountain works with masterpieces from four historic Muslim dynasties with close ties to Afghanistan. This dialogue between new and old placed Afghan art on a world stage and marked a peak moment in its ongoing reinvigoration. A painting student fills in a 16-point geometric composition. 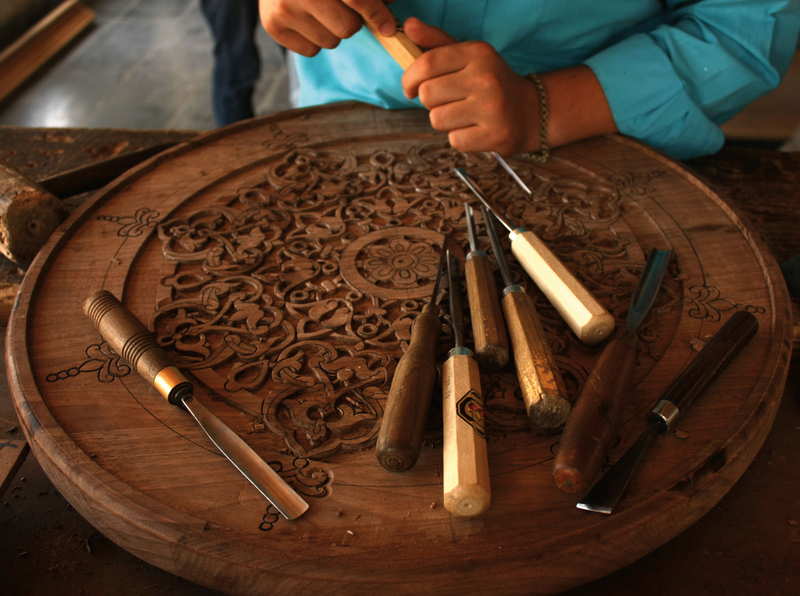 Chiseling between his guidelines, a wood-carving student carves out an eight-point floral arabesque. All draw upon Afghanistan's rich and colorful artistic heritage. 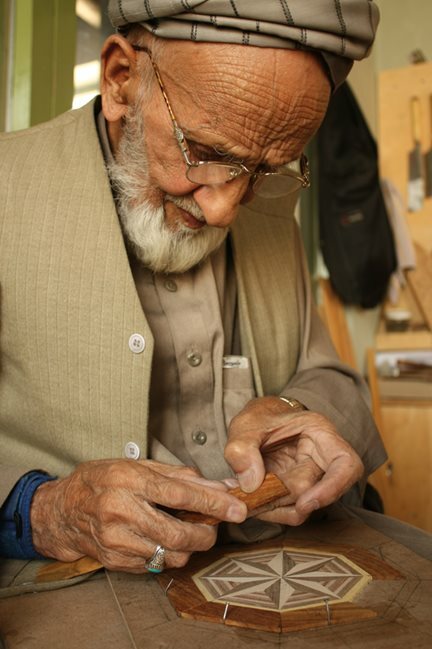 Eighty-six-year-old woodworking master Abdul Hedy, once crafted pieces for Zahir Shah, the last king of Afghanistan. Now, his students, below, tackle a project in their studio in Kabul. The “Ferozkoh” exhibition, which opened at the mia in March 2013 and traveled that fall to the Leighton House Museum in London, gave Turquoise Mountain artists a chance to move from designs for commissions and serial production to the creation of one-of-a-kind artworks. Beautifully displayed at the mia and Leighton House, the results reached across the centuries: Gold earrings, created by 28-year-old Kabul resident Monawarshah Qodousi, appeared to float next to a similarly patterned, 16th-century velvet from the Safavid dynasty; a wooden, inlaid pilaster by a team of 11 artists rose alongside a terracotta merlon, or center section, from a 10th- or 11th-century Ghaznavid-era battlement; four inlaid marble floral plaques picked up on motifs in a Mughal miniature. 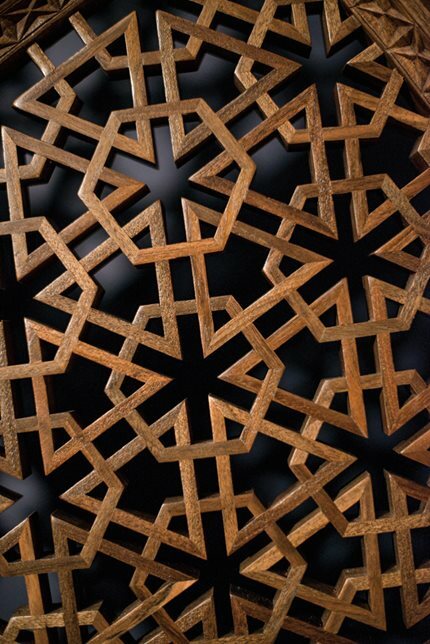 Cheshti’s own “Ninety-nine Names of God” conversed with a 15th-century Timurid wood carving. The exhibition in Doha featured 37 works by Turquoise Mountain students and teachers, and each work was paired with a mia masterpiece. About half that number appeared in the London show. Fast forward to 2011. Michelsen, by then head of the mia’s curatorial and research department, floated the idea of a small show of works by Turquoise Mountain artists, who would be invited to the opening. From mia Director Aisha Al Khater on down, the response was so enthusiastic that when a large exhibition fell through, Michelsen hatched a bold, even risky plan: Invite Turquoise Mountain artists for a longer spell, and let the exhibition grow out of their exposure to the museum’s collection. One thing was clear: The museum was not interested in having artists “replicate the pieces that they saw but, rather, put a new twist, a new dynamic into it,” explains Deedee Dewar, who ran the mia’s art-education center. Copying is valuable for skill-building, she notes, but the arts of Afghanistan would not be as varied and rich as they are had there not always been an interactive, creative process at work through the centuries. 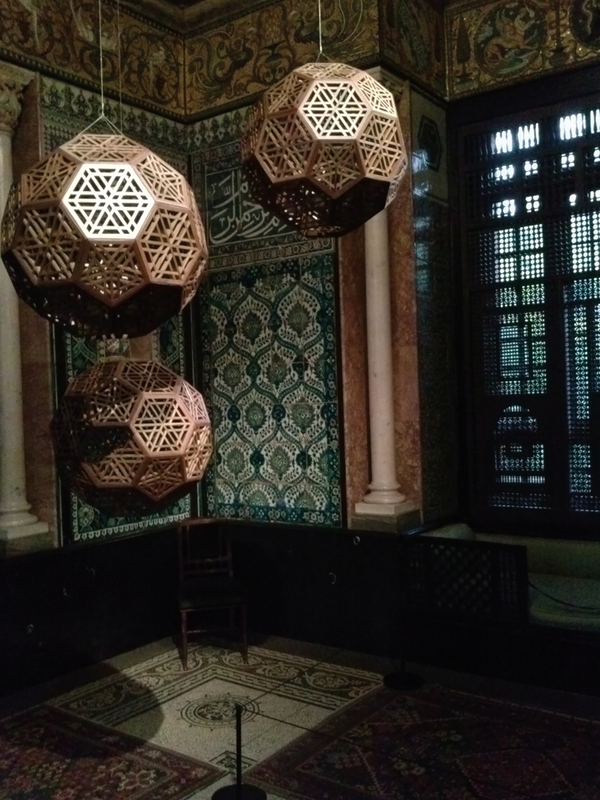 Top: An artisan joins thin wooden pieces into hexagons that were later joined with pentagons to build "jali balls," above, which hung in the Leighton House Museum's domed Arab Room as part of the “Ferozkoh” exhibition, where they complemented a wall of tiles from Damascus. To do this, the Turquoise Mountain artists first studied and handled the masterworks up close. They could feel the weight and thickness of an eighth-century ceramic vessel or run their fingers over the carvings on a centuries-old wood panel. While one artist examined the underside of a brass bowl, another peered through a microscope to inspect the pigments and brushwork in a miniature painting. Museum staff noticed that as the artists explored the collection, they tended to circle back to works from Afghanistan. “This makes sense completely,” Michelsen says. That gave her the idea of organizing the “Ferozkoh” exhibition around four Muslim dynasties that ruled over all or parts of Afghanistan. At first, however, she and her mia colleagues were intent on helping the artists make a leap from admiration to inspiration. This is where Dewar came in. 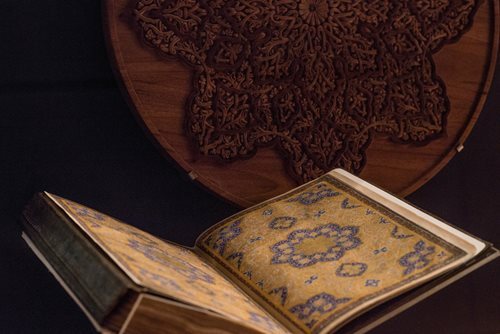 Dewar, who speaks in a broad Scottish brogue, handed the visitors sketchbooks whose pages were textured, gold-leafed or roughed-up “to kind of trip them up,” she says. She even made them tear a hole in a page to see the drawing on the next poke through and thus maybe trigger an unexpected connection. At other times, they found themselves drawing on tissue paper “to think of layering,” Dewar explains. She also encouraged jewelers to experiment with wood, ceramists to think in terms of metal and painters to imagine clay, “to show them that there are a hundred ways to approach a single object,” she says. And when they sketched, she told them to record their reactions—a detail that thrilled, a shape that captivated or intrigued, or a variation on composition or form they might like to try. 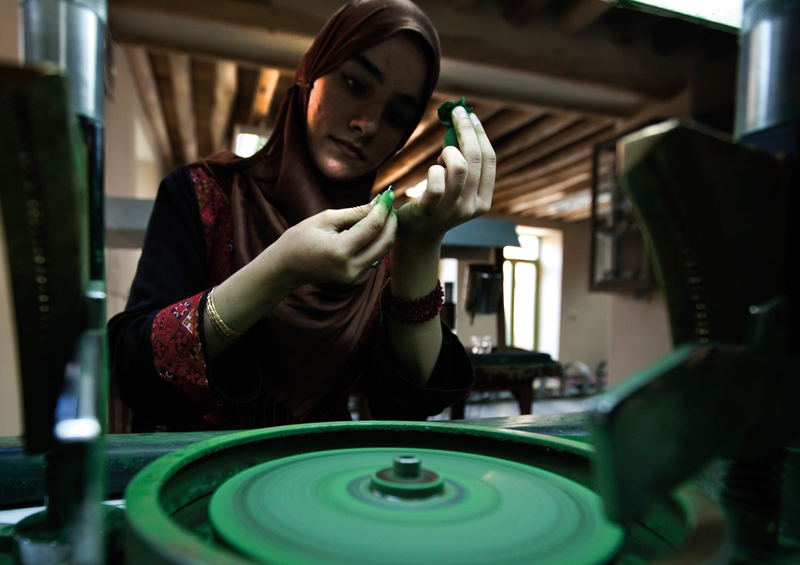 Top: Storai Stanizai facets a gemstone and, above, applies the finishing touches to one of her jewelry creations. Initially a student in miniature painting and calligraphy, she switched to jewelry and now often combines the two media. 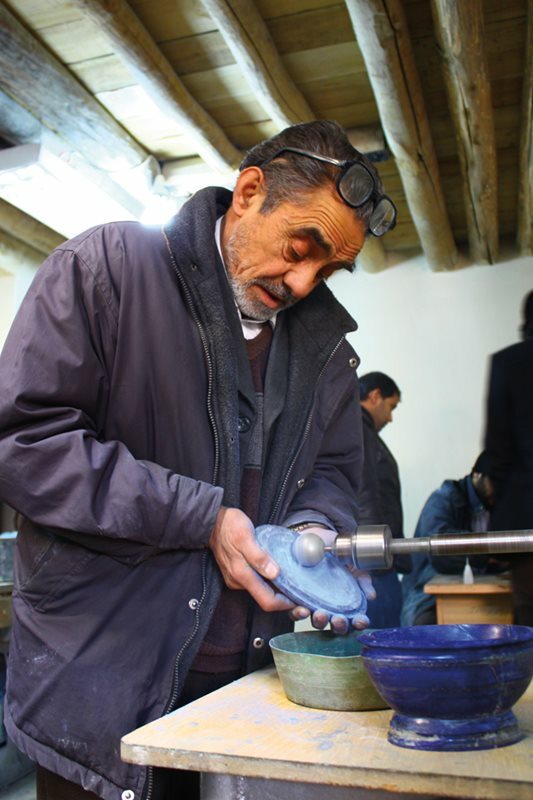 Master jeweler Abdul Azim works in the studio in Kabul. At the museum and on field trips to sites around Doha, the artists exposed themselves also to modern art in its many forms, and although this might have at first seemed disconnected, by doing so they were in fact tapping into a centuries-old practice. University of Illinois Urbana-Champaign art historian Heather Grossman comments that a museum is a repository, similar to, say, the treasury of a medieval court or mosque, an ancient commercial storehouse, the burial hoard of a wealthy merchant or even a market along a lively trade route. She likens a museum experience to that of an Afghan court painter granted occasional access to his patron’s library, or a potter whose brother lets him slip inside a commercial storeroom, or a wood carver or jeweler browsing through imported textiles and metalwork at a market. Dewar’s workshops also echoed another traditional process, one that Ludovico V. Geymonat of the Max Planck Institute for Art History in Rome described in a 2012 issue of the journal Medieval Encounters. He argued that the draftsman of the 13th-century Wolfentbüttel Musterbuch, considered the quintessential medieval book of artistic models, was not so much copying statues he saw on his travels as he was sketching his responses to them, thereby “exercising the hand, memory and imagination.” Once back home, Grossman explains, the draftsman would then refer not to the originals that caught his eye, but to the ideas they inspired. 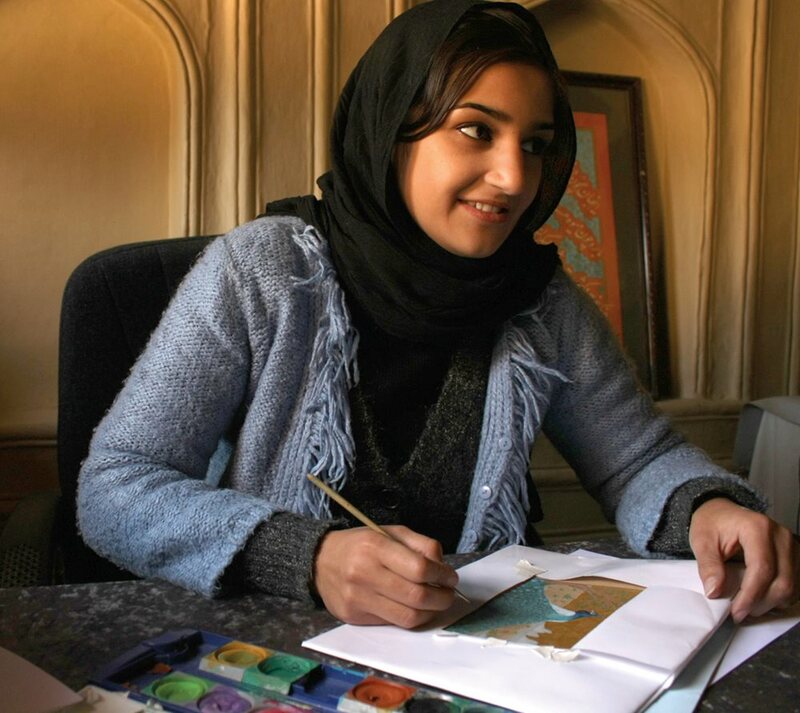 During her time at the mia, 26-year-old Turquoise Mountain painter Fakhria Nezami followed in the draftsman’s footsteps. 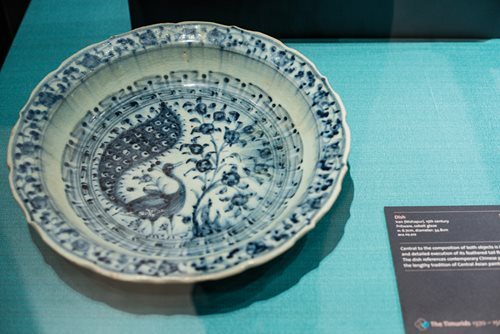 She found herself drawn time and again to a 15th-century dish from Iran on which a peacock was profiled in cobalt-blue glaze, its tail arching over its body to echo the curve of its slender neck. More playful than resplendent, the bird looked ready to nip a flower off a wispy tree. Nezami remembers pulling out her sketchbook and drawing the peacock not as it appeared, but in different poses and proportions. In a similar vein, a band of clouds painted on a bowl from the same period moved painter Tamim Sahebzada and jeweler Mosawarshah Qodousi to collaborate on a large silver pendant in the shape of a cloud. Both the peacock and the clouds on the bowl, it turned out, were themselves Persian riffs on Chinese imports, and now, centuries later, Nezami, Sahebzada and Qodousi were playing off them in turn. Meanwhile, woodworker Mansori teamed up with ceramist Malekzada. Inspired by the carved terra-cotta panels he had seen on a visit to the 12th-century masterpiece Minaret of Jam—believed to be one of the few surviving remnants of the historical Ferozkoh—Mansori had long wanted to try his hand carving into clay. Malekzada was galvanized by the notion of making a ceramic ball. Together, they agreed to use a rare 12th- or 13th-century necklace of hollow gold beads with patterns fashioned in granules and repoussé as their muse. 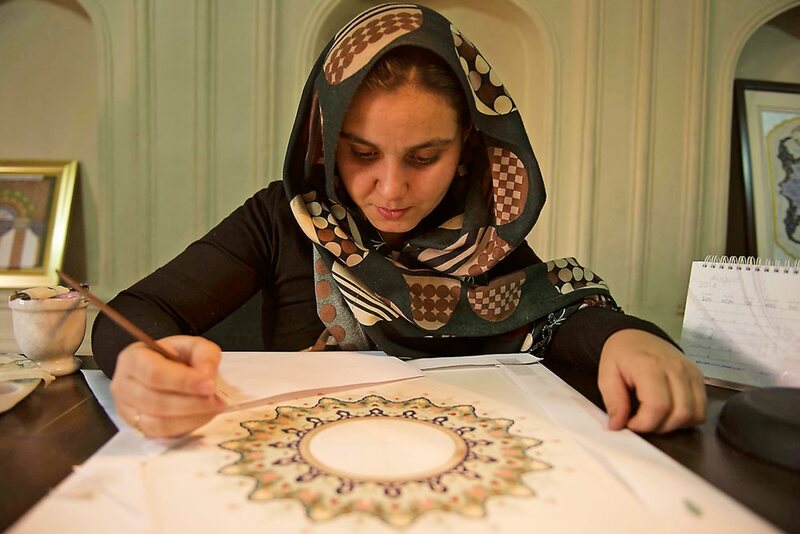 After finishing her three-year course in calligraphy and miniature painting at Turquoise Mountain, Samira Kitman established Muftah-e Honar (“The Key of Art”) in Kabul, going on to win a commission to provide 600 hand-painted calligraphy and illumination works to the Anjum Hotel in Makkah, Saudi Arabia. 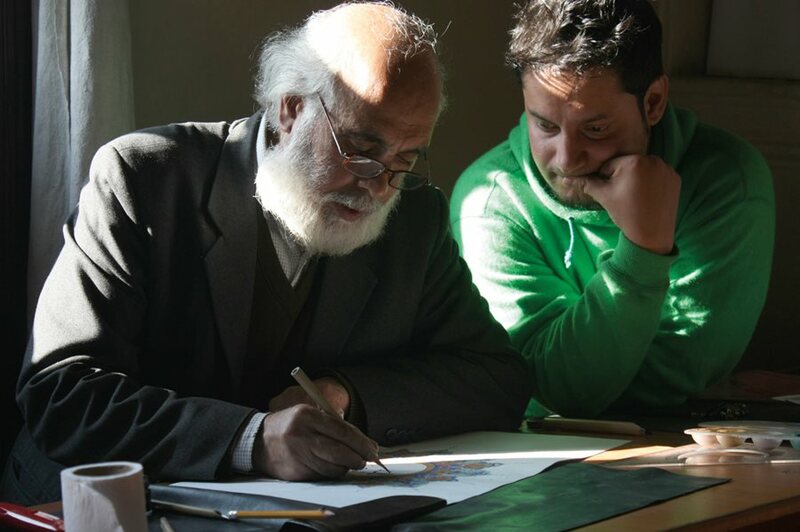 Tamim Sahebzada, who took refuge in Pakistan while the Taliban controlled his home city of Kabul, now teaches calligraphy at Turquoise Mountain. 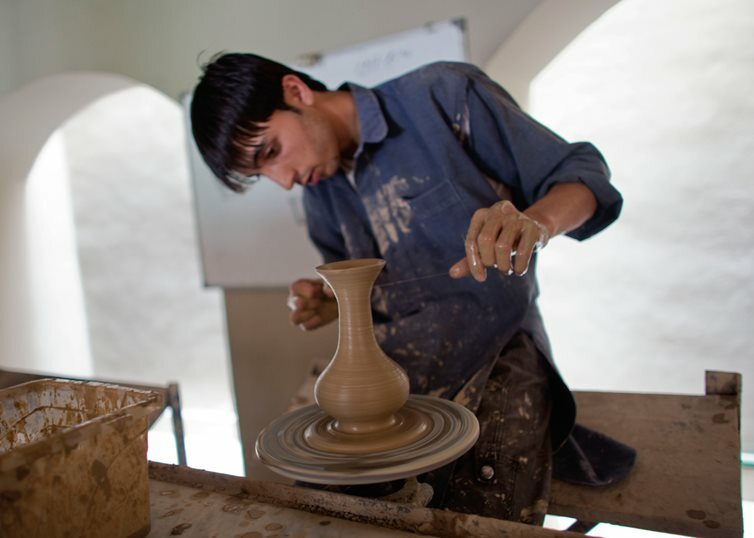 A ceramics student shapes clay mined from the Hindu Kush Mountains into a vase that will be for sale to the public. The two weeks flew by as the artists took turns consulting with mia staff and each other. Then, back in Kabul, their real work began. 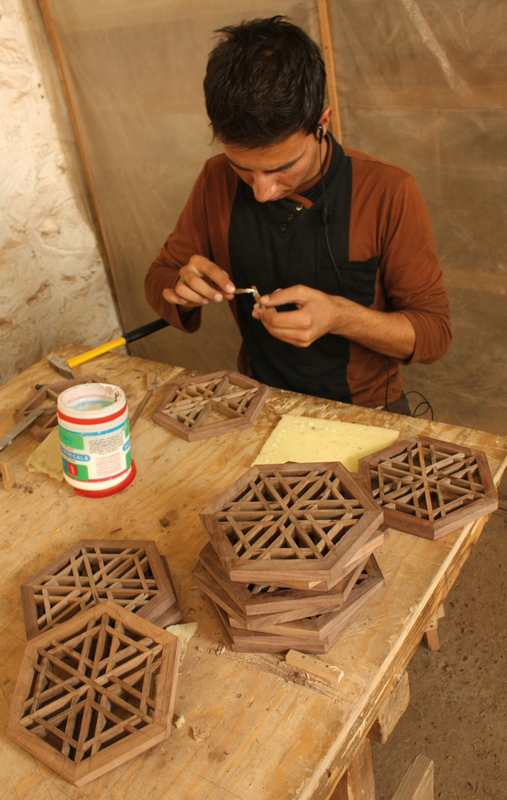 In his workshop, Malekzada experimented with mixtures of clay and firing temperatures. The best combination, he discovered, was 480 degrees centigrade with a blend of clays from Logar and Parwan provinces and his native Istalif, a centuries-old ceramics center near Kabul. For his part, Mansori found that “unlike wood, a ball is like an egg—it breaks.” So he modified his tools, allowing him to carve designs into the circumference and top. Michelsen also reviewed Nezami’s preliminary renderings, and she chose one in which Nezami inverted the 15th-century dish’s composition and portrayed the peacock with a regal demeanor. In her final painting, the sky is a rich gold and the bird’s body a deep lapis; its tail fills a third of the composition, like the sumptuous train of a court dress. “The museum would have liked nothing in the background,” Nezami says, “but I added a tree and flowers because it was a natural place for the peacock.” She also painted a mountain in the distance with a single barren tree, its starkness imbuing the scene with subtle poignancy. Nothing could be farther in tone from her 15th-century inspiration. Fakhria Nezami, top, was among the artists from Turquoise Mountain who in 2012 visited Doha's Museum of Islamic Art. Inspired by the design of a 15th-century dish from Iran, below right, she painted “The Peacock” for the “Ferozkoh” exhibition. 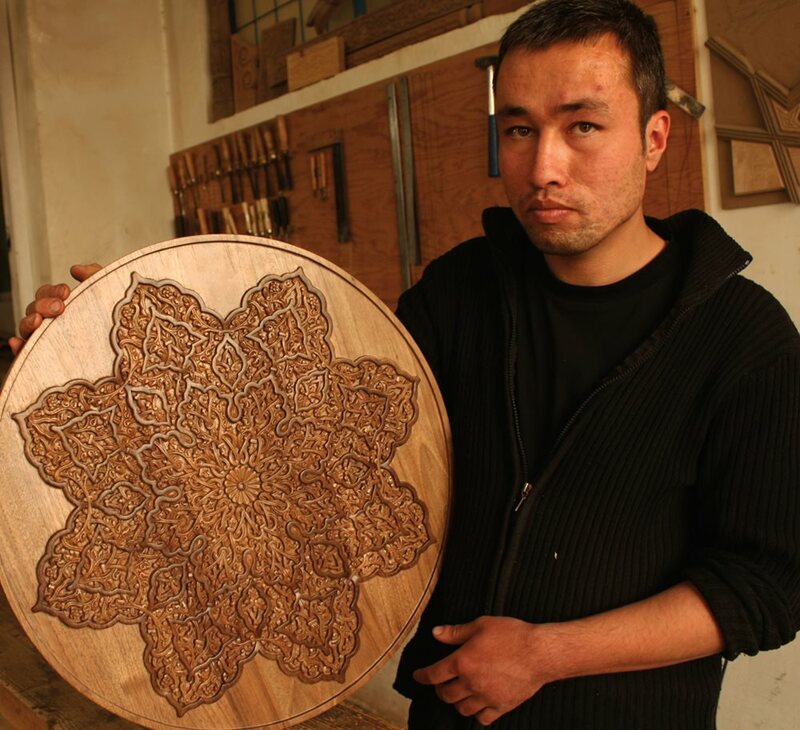 Above: Taqi Rezahy, from Bamiyan, displays a medallion with a shamsa pattern symbolizing the sun: He drew inspiration for his exhibition piece from the illuminated pages of the 17th-century Qur'an of Shah Sulayman Safavi, bottom, right. On visits to Kabul, Michelsen came in for another surprise. Only about half of the artists whose work she ended up choosing for the show were ones who had taken part in the Doha visit. The idea all along was that those who went to Doha would, upon their return, “act as seeds,” she says. Indeed, it happened rapidly as artists who had participated in the Doha experience worked in teams alongside peers who had not. But it was not always so direct: Second-year student Helai Habibi created a painting of an elephant, and her sensitivity and inventiveness won her a place in the show. Habibi had not gone to Doha, but one of her teachers, Tamim Sahebzada, had, and it is easy to see in Habibi’s work its connection to Sahebzada’s “A Group of Three Camels,” which was a result of experiments after his time at the mia. In his painting, Sahebzada silhouetted the animals against a gold-leaf surface that he textured by punching into it thousands of tiny dots. He painted the central camel with a lapis-based watercolor, animating its surface with barely discernible circles and arabesques. In her painting, Habibi set a single animal against a plain background and, using the finest of brushes, conveyed the tones of skin and saddlecloth with a delicate stippling, enlivened at times by ever-so-minute circles and curls. Michelsen worked with Habibi to identify an object that paired well with her painting for the exhibition; they agreed on a Ghaznavid bracelet that recalled the ornaments depicted on the elephant. But what Habibi was really responding to was most likely her teacher and, more specifically, his responses to objects he had seen in Doha. 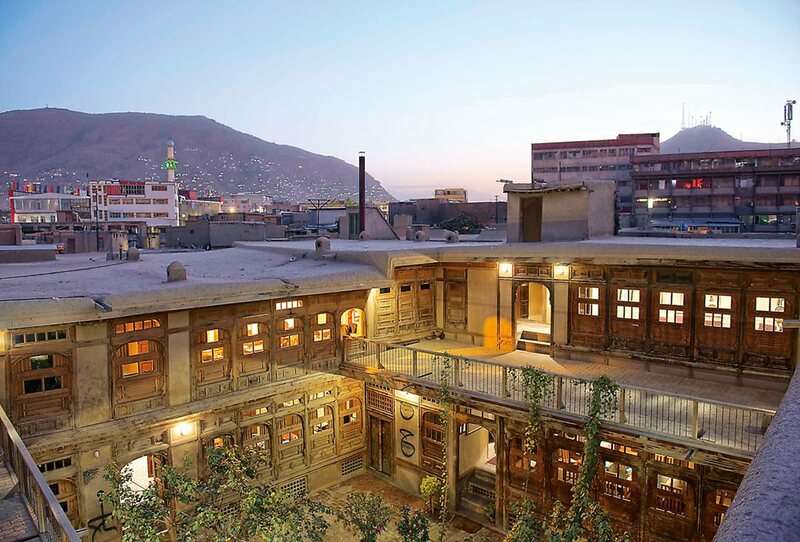 New home and a centerpiece for traditional arts, the Turquoise Mountain ("Ferozkoh") Institute for Afghan Arts and Architecture stands in a refurbished, 19th-century fort in Kabul's old city of Murad Khan, once famed for its bazaar and architecture but much deteriorated from years of war. At the exhibition, visitors might have been forgiven for not always being sure which piece was the historical one and which the contemporary, so comparable were they in quality. “Ferozkoh” proved that its teachers, students, and graduates could create not just traditional artworks, but new, unique ones that blend respect for tradition with interpretation and creativity. Their biggest commission to date came shortly after the “Ferozkoh” exhibition when the owner of the hotel Anjum in Makkah, Saudi Arabia, ordered some 6,000 diverse pieces for about $600,000, says Fuchsia Hart, who for the next six months oversaw the resulting work by some 30 artists as they produced ceramic panels, vessels, wood-carved architectural elements, calligraphic works and paintings. To fulfill the hotel commission, the institute subcontracted some of the work to Turquoise Mountain graduate Samira Kitman, a calligrapher whose company produced more than 600 original hand-painted calligraphy and illumination works. Thalia Kennedy, who headed the Turquoise Mountain Institute from 2007 to 2010 and who now works for the mia, says that after the 2012 Doha visit, “the quality of design really lifted,” particularly in tiles and miniature painting. She points to another benefit, noting that “the design and production process, and [learning] how to respond to a client—which in some ways the museum was—builds artisans’ business acumen.” The mia has since followed up with a couple of weeklong workshops in Kabul and a contract by which Turquoise Mountain will supply mia’s shop. Three years after the Doha trip, participants continue to speak of an experiment they still want to try, a piece they cannot forget or a practice they have changed. Mansori today incorporates sketching exercises into his teaching, and Malekzada has responded in clay to an ancient bronze dish with Kufic script. Enchanted by the peacocks he saw in the margins of a manuscript, Sahebzada wonders what it would be like to depict them large in a mix of traditional and contemporary techniques, while Nezami keeps thinking about “the really amazing power” and the use of gold in a copy of the Shahnameh, the Persian national epic. Cheshti, for his part, has expanded his teaching to include calligraphic styles popular with Middle Eastern clients. 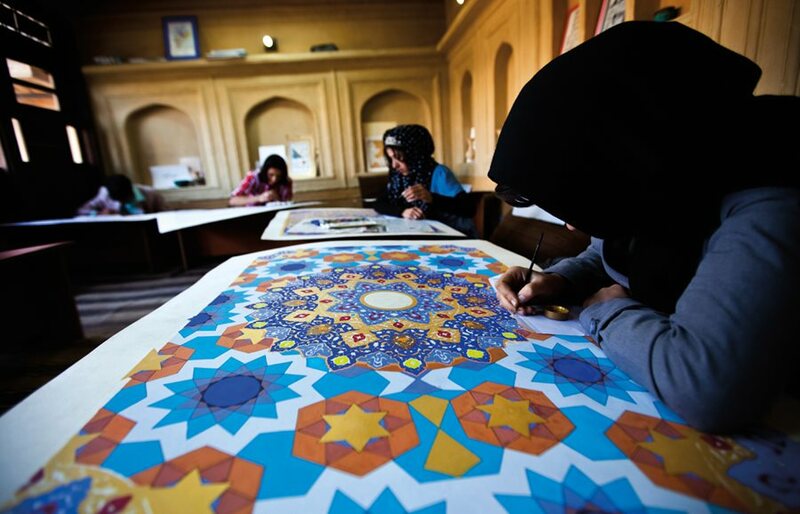 At the same time, he is wrestling with the challenges of creating a copy of the Qur’an on silk—but not in isolation. Sahebzada is helping him treat the fabric so that it will take the ink, and works from other times and places provide the calligrapher with the seeds of inspiration and innovation. This spirit resonates beyond the walls of Turquoise Mountain, too, as its graduates incorporate in their own workshops this new connection to heritage. It is a connection embodied by the revered 15th-century miniature painter from Herat, Kamaleddin Behzad, whose commanding skills showed both a mastery of his forefathers’ techniques and great originality. It was this combination, for him then as for the Ferozkoh students today, that gave enduring energy and life to the art of one of the most culturally rich countries in the world. The author extends heartfelt thanks to Zabihullah Noori of Turquoise Mountain for invaluable help as an interpreter.